the imaginative realities of the inner world of feeling and idea. A fear of being mad. A fear that letting go of common sense and letting in imagination means letting in madness. are you going to patch a mile? that's a looooooong cloth! A little madness is healthy. You know how much I like big ideas, and this one is big! Of course it relates to walking, marking steps, marking distance, marking time. All. And more. I find it ironic that I began to piece it when I could no longer do the daily walk and it became even more a symbol of a life pathm more than a record of a particular place. Back for a second look, and I have a question: what are the white "bands"? I had the idea to make an art piece about my daily walk, because I felt that my foot steps were like stitches, sewing me to this place where I live and walk every day. For about a year and a half I put a piece of white fabric into a basket when ever I did the walk - not knowing if I would colour that fabric with dye or how i would use it. Just that I wanted to mark that I did the walk and would use these fabric pieces in the art work that I would do some day. Then I lost my ability to do that walk - I have not done the full length of my walk since May 3. 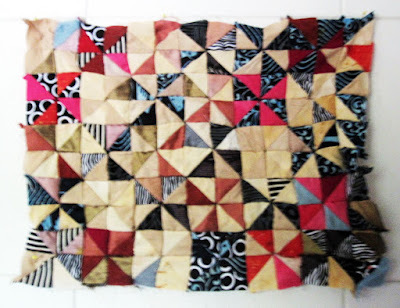 So my idea morphed a bit - and I began the idea of the path - following Tim Ingold's idea that we actually do not live in a place - we live on the path to and from that place - and I thought that I could use up the fabrics I have collected over my life time and make a life-path. Memories came over me as I went through my baskets and cut the cloth up - using these cloths from my lifetime of quiltmaking and living - to make a luminous halo (Virginia Woolf's term) life path. But I still had those white squares - and I broke my leg, as I said before. So - in July I noticed the tall sweet clover that has a strong stalk and a beautiful scent growing in abundance on our beach, and got ned to get me some and I broke it into managable lengths and wrapped it in the white fabric. When April was home, she told me that these wrapped bundles resembled bones - and I realized that I was making little bundles of my self - in the shape of a femur bone. In this photo they are on the path - I thought I could use them like foot steps to follow my original idea of sewing myself to the land with the running stitch-foot step-ladder of life kind of ark. But they stand out and do not work visually - I see that. So tonight i took them off the path and am thinking how to use them as an addition to the path - or instead of the path. Gotta go do some sketching and thinking. Thanks for the question - i have been thinking about it all day myself. I use my design wall like a sketch book. I use my black hard covered sketchbook/journal to keep my thoughts and quotes from what I am currently reading. 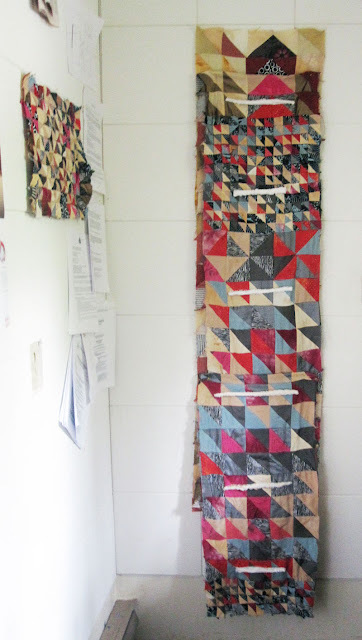 This blog juxtaposes photos of my design wall with the newest words from my sketchbook/journal. Sometimes they seem to go together, which is interesting to me. Ideas and false starts and things I read are important to my process. This blog just records, it does not analyze. This blog is a glimpse into how I work. The labels below are a guide through each piece's evolution. Some pieces have long histories, others only a passing glance. Please use the labels to navigate. Resolved work and thoughts will continue as usual on my main blog, Judy's Journal.